In the early days of the Healing Church the group of scholars operated mostly in secret. 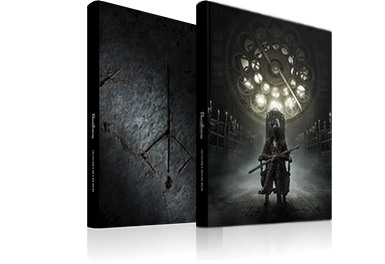 Gehrman's Workshop would serve as a secret police force for the Church, while Micolash would found the School of Mensis, a new institution of learning for the Church to continue the research at Byrgenwerth. According to the Upper Cathedral Key: "The upper echelons of the Healing Church are formed by the School of Mensis, based in the Unseen Village, and the Choir occupying the Upper Cathedral Ward." This key is found in Yahar'gul on the corpse of an imprisoned Choir member. From their new, secret location in Yahar'gul, Micolash's new School of Mensis would be protected and hidden by the Healing Church. The Yahar'gul attire tells us: "The hunters of Yahar'gul answer to the village's founders, the School of Mensis. Hunters in name only, these kidnappers blend into the night wearing this attire." From their hidden conclave, servants of the School of Mensis would skulk out into the night and kidnap innocents to drag them back to Yahar'gul for their experiments. The PC Hunter can be one such kidnapped victim if they die to a Kidnapper, an enemy that first make their appearance after the death of the Bloodstarved Beast. The Hunter also encounters and fights two Yahar'gul hunters lurking outside of a home in the Cathedral Ward, possibly searching for more victims. 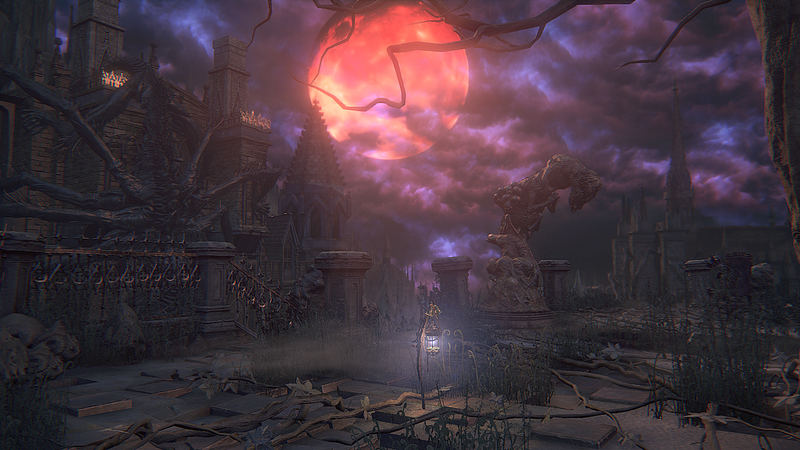 Yahar'gul, Unseen Village (Evening): This version of Yahar'gul, Unseen Village is only available up until you defeat the boss in Byrgenwerth, changing the time to Blood Moon. At that point all of the Kidnappers get killed, and many other changes occur in the area, so if you want to check this place out, don't leave it too late. At the end of the Village Outskirts in the Forbidden Woods. It's important to remember, however, that you will still lose your Blood Echoes when the Kidnapper kills you, so make sure you spend them first before triggering the event or keep in mind to return to the place where Kidnapper killed you without dying along the way. Burning Corpses (Blood Moon): If a Cramped Casket touches one of the burning corpses situated in craters throughout the streets of Yahar'gul it will take heavy damage and burst into flames, drastically reducing its speed and weakening its attacks for sixty seconds; while this provides an advantage for a relatively long period of time, beware that each corpse will run out of power after being touched several times. 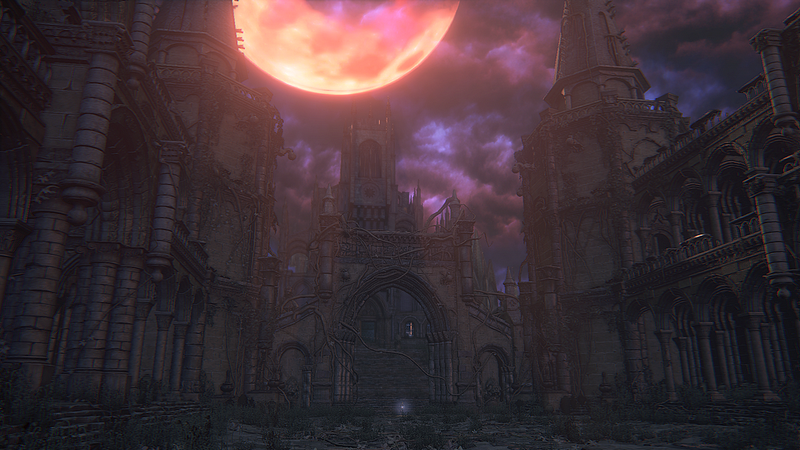 Yahar'gul Skip (Blood Moon): The Yahar'gul Skip is a skip in Bloodborne in which the player exploits the geometry of the level in order to clip out of bounds and avoid traversing through a large majority of the level. The skip is located right after the initial lantern that becomes available after defeating Rom. Using their using animations that give their character forward momentum they are able to wedge themselves between two fence posts and fall down to the lower area of Yahar'gul. A Blue Elixir is commonly used with this skip in order to avoid drawing the attention of a second enemy when performing the skip. If the player finds themselves on the ledge of the fence after performing the skip, the use of the Hunter's Salutation gesture is enough to drop them to the next platform. Yahar'gul, Unseen Village (Evening) | Lamp: Nightmarish rituals crave a newborn. Find one, and silence its harrowing cry. Yahar'gul, Unseen Village (Evening) | Prison Cells: Madmen toil surreptitiously in rituals to beckon the moon. Uncover their secrets. Yahar'gul, Unseen Village (Evening) | Main Street: Behold! A Paleblood sky! Yahar'gul, Unseen Village (Blood Moon): The Mensis ritual must be stopped, lest we all become beasts. Defector Antal: Summon sign is behind the last carriage before the fog gate to The One Reborn, on the left. He can't take the shortcut lift. Confederate: Behind a carriage on the left side of the road a short distance before the boss room of The One Reborn. In order to summon Yamamura for this fight, you must first kill him in the Hunter's Nightmare and equip the " Impurity" rune. You can summon either Yamamura or Antal to assist you in battle against The One Reborn, but not both simultaneously. Obtain the Moon Caryll Rune from the Yahar'gul Chapel. Get Tonitrus from Main Street - West. Kill Darkbeast Paarl to acquire the Spark Hunter Badge and open up the back way into Old Yharnam so that you can speak with Djura and peacefully get the Powder Keg Badge. Go to the Holding Cell to acquire the Upper Cathedral Key and Tiny Tonitrus. Kill The One Reborn and inspect the mummy in the next room to be taken to Lecture Building 2F. After being defeated by the Kidnapper and taken to Yahar'gul you'll awaken in the Prison Cell they use to hold their captives, but as luck would have it they've left the cell door unlocked. Exit through the door and head around to the left, where you'll find a staircase leading up. Halfway up the staircase you'll see an open doorway, and while that path will take you almost straight to the boss of the area, it's worth taking the time to continue up the stairs and activate the Hypogean Gaol Lamp at the top. If you head around to the right when you exit your cell, you'll come to a small storage area with an item and a number of Huntsmen sitting dormant on the floor. If you try to pick the item up, or walk too close to them, they'll begin to get up, so try and kill them quickly before they can fight back. Continue down the stairs and you'll come to another storeroom, where an Adella can be seen cowering in the corner. Trying to talk to the Nun will usually result in her asking to be left alone, but if you equip any church related garb (such as the Black or White Church Garb), she'll assume you're a member of the church and be much more responsive; you'll even get the option to send her to one of the sanctuaries you've opened up. As you start going down these stairs you'll see an Eye Collector running across the doorway at the bottom, letting you know that you'll be in for a fight once you get down there. The direction she was running in, however, is meant to distract you from the real threat, which is a second Eye Collector hiding around the corner to the right on the other side of the doorway. If you were to just walk through the doorway, she would immediately grab you with a damaging attack. To avoid this, you should sprint down the stairs and roll through the doorway before taking her on. The other Eye Collector will usually start patrolling through the cells to the left, where there are also a number of Huntsmen sitting on the floor, so try to take her out without awakening them. Before advancing to the Dining Room, make sure you kill all of the dormant Huntsmen to ensure that they do not attack you from behind later. In the middle of the Dining Room there are two Kidnappers standing around a table, and taking them both on at the same time can be quite challenging. There are two ways into the Dining Room; one through the small cell by the base of the stairs, and the other through the large cell on the other side of the room. If you approach the doorway in the small cell slowly you can get the Kidnapper on the far side of the table to spot you, so that you can lure it back into the cells and fight it away from the other one. The remaining Kidnapper stands with his back to you, and once he's on his own you can sneak up behind him and use a charged R2. After they've both been defeated, go through the hole in the wall at the back of the room and follow the tunnel along to drop back down into Old Yharnam, where Darkbeast Paarl awaits you. Once you drop down from the end of the tunnel, however, you will be unable to return, so make sure you are well equipped for the upcoming battle. After following the narrow path you will come face-to-face with Darkbeast Paarl, a fearsome creature that guards the route back into Old Yharnam. Upon defeating it, you'll acquire the Spark Hunter Badge to increase your shop inventory, and the Graveyard of the Darkbeast Lamp will become available. Before you leave, however, you should make sure to open the large wooden door nearby, so that you can use this Lamp as a shortcut to the back of OldYharnam if needed. If you came straight to this point after you entered Yahar'gul, it's worth returning to the Hypogean Gaol Lamp so that you can explore the area. Encountering this boss and you climb up Djura's tower without him seeing you, you'll be able to reach a peaceful resolution with him. There are two Kidnappers that you have to contend with in this room, and if you came here straight from the Prisoner Holding Area, they will both usually be positioned in the middle of the room on either side of an item. To make the fight much easier it's recommended that you use the Hypogean Gaol Lamp at the top of the room to leave and then return, as that will reset the Kidnappers to their starting positions. One of them will be walking down the stairs just in front of the Lamp, and the other will be approaching the middle from the doorway at the opposite end of the room. If you attack the one on the stairs nearby quickly you can fight it without any interference from the other one in the middle of the room. After taking them both out and grabbing the item in the middle of the room, start heading towards the door at the opposite end; make sure you go around the right-hand side of the large pillars rather than through the middle, because an Eye Collector is waiting to ambush you from behind the one on the right. After stepping onto the stairs outside Yahar'gul Chapel, you're faced with a number of possible routes to take, but don't start exploring just yet - a Maneater Boar will start walking up the stairs directly in front of you as soon as you enter the area, and if you wait near the door it will pass you by and you can sneak up behind it for an early advantage in the fight. Although you can see a number of bridges and buildings above and around you at this time, most of them are not accessible until you return here later on. If you head around to the left from the Yahar'gul Chapel Stairs you'll be able to use this alley to reach one of the one-way doors that are near the Hypogean Gaol Lamp By opening the door you'll be able to avoid having to go through the Yahar'gul Chapel to reach the Main Street outside, which will come in very handy later in the game. Along the alley you'll also find a Wandering Nightmare - be sure and kill it to gain some additional weapon upgrade materials. This large, open street has a number of enemies along it, but thankfully there are also a lot of things in the environment that you can use to your advantage when taking them on. The first threat you need to deal with is a Maneater Boar in a small alcove. If you were to run straight up the street, the Boar would come charging out at you and be very difficult to avoid. If, however, you stick to the left side of the street and approach slowly, you can get it to charge into a gap between the wall and a statue that is too narrow for it to fit through. While it's struggling to get free you can run in and attack it quickly, and if you see it start to attack, simply drop back to avoid it easily. Move up the street sticking to the left-hand side and you'll start to see pairs of Rabid Dogs patrolling the area just past a large wagon; try to attract them individually using Pebbles and fight them behind the wagon, away from the others. If you get spotted by a few of them, circle around the wagon so that you always keep it between you and the majority of the enemies, and try to attack them at the corners of the wagon using weapons with long reach. At the end of the street are two more Rabid Dogs and a Kidnapper. Try to take advantage of the dogs' speed and lure them back away from the Kidnapper, so that you can fight them separately. The two large statues on the right-hand side of the street can provide an excellent place to fight the dogs from; you can use the statues to block the attacks of the dogs as they run towards you, and then quickly attack them before they recover. By going up the small set of stairs near the Yahar'gul Chapel Stairs you can reach a small raised path that runs alongside the Main Street for a short distance. If you follow the path along to the left from the top of the stairs, you'll be able to find an item hidden in a small niche in the wall. Taking the path back around the other side of the building will lead you into a small room, at the end of which is the bottom of an elevator shaft. Unfortunately, you cannot activate the elevator yet, and will have to wait until you return here later. The stairs just outside the elevator room will take you up to a small paved area, where there's a break in the railings overlooking the Main Street. If you perform a running jump through the gap you can land on the roof of the large wagon, allowing you to use ranged attacks on the dogs below, if you have any. Heading down the large set of stairs in front of Yahar'gul Chapel will take you to the area just in front of the large Main Street Gate, where you'll be able to acquire a large number of items. Just in front of the gate are a couple of Rabid Dogs, so make sure you deal with them first before moving around to pick up the items. The gate has clearly not been opened for some time, and remains firmly shut, so you cannot pass through it at this point in the game. Following the path around to the right from the Yahar'gul Chapel Stairs will allow you to reach a narrow access path lined with pillars, at the end of which are a Kidnapper and two Rabid Dogs that are slowly making their way towards you. As you get close to the enemies the dogs will be the first to see you. Once they do, wait for them to run towards you and use the pillars in the area to help block their attacks while you fight them. If you're quick, you should easily be able to kill them before the Kidnapper gets close, at which time you can again use the pillar as cover while he attacks, and then circle around and attack him from behind. The stairway at the end of the path leads to a small courtyard with a couple of items to pick up. The door in this area can also be opened from this side to give you another entrance point to the Prison Cells and back into the Yahar'gul Chapel. 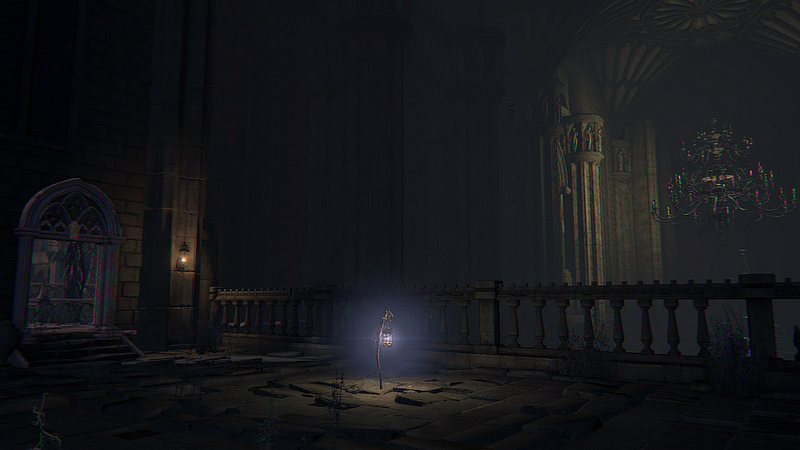 The door in Cathedral Ward that leads to this area will open after you defeat Rom, the Vacuous Spider in Byrgenwerth. Sprint straight ahead through the door without stopping in order to avoid being grabbed by the False God. Reaching the bottom of the stairs, you'll hear a bell chime and a couple of Huntsmen will spawn from the ground ahead of you. While you've faced these enemies before, they are not to be underestimated here. Their blood aura is being placed there by a nearby Bell Ringer, and it grants them a huge defensive boost. To make matters worse, any enemy killed will always be brought back after a short period of time, until the Bell Ringer is dead. Killing her will also cause the blood aura to be removed from any enemies still alive, and not only will they be severely weakened after that, but it causes them to writhe in pain briefly, giving you a small window to attack. These reappearing enemies will only grant Blood Echoes the first time you kill them, although they can keep dropping items. After making it past the first two enemies you'll come to a stairway, and as soon as you start walking down it another Huntsman will come around the corner at the bottom and run towards you; make sure you kill him before doubling back along the stairs to get the item there. 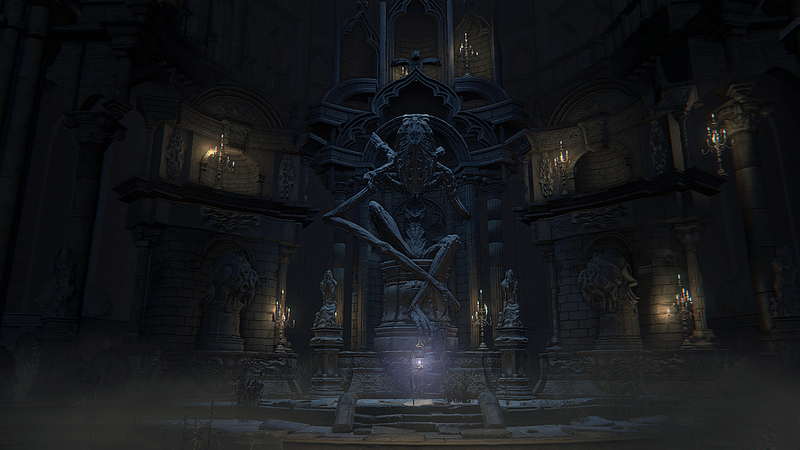 At the bottom of the stairs you'll find the Yahar'gul, Unseen Village Lamp. It's important that you light it, because the Hypogean Gaol Lamp has been destroyed, making this Lamp your only way back here for now. The stairway here leads down to an elevator, and along the way a Bloodstone Chunk can be found in a corner behind a statue. There are a lot of Bloodstone Chunks to be found in this area, and if you gather them all you can significantly increase the overall strength of your arsenal. At the bottom of the stairs you'll see another item on a corpse near a statue, and while it may be tempting to run straight ahead and get it, a Wheelchair Huntsman with a rifle has his sights on it from around the corner to the left. Hide behind one of the pillars until after he fires a shot, and then quickly close in and kill him while he reloads. The other Huntsman that's standing just outside the elevator room may spot you, so deal with him before finally picking up the item. You cannot make use of the elevator at this time, so continue along the main route once you've looted the area. It's best to run straight past the group of enemies at the bottom, and make the Bell Ringer your next target. If you were to start fighting them, there's a strong chance that the first group will start to reappear and you'll get caught in the middle, with your movement limited due to the False God's attack. When you enter the room at the bottom of the stairs, head around to the left rather than the right, because there's another Huntsman waiting just inside the door on the right. While you're fighting the Bell Ringer, keep in mind that a couple of the Huntsmen will sometimes follow you into the room. As soon as the Bell Ringer is dead, quickly return to the second group of enemies and try to kill some of them while they writhe in pain from her death, before killing the rest in their now weakened state. About halfway down this small curved staircase there's a gap in the railings on the right that you can drop through. By doing this you'll be able to skip the large room at the end of the stairs entirely. If you choose to go through the room you can bypass the Sacrifice Square initially, but if you want the Upper Cathedral Ward Key you'll have to fight the enemies there when you come back around. The ledge you land on after dropping through the gap also has some useful Bolt Papers on it, so grab them before dropping down again to Sacrifice Square. The door that leads into this room cannot be opened from the outside - you can only enter via the large hole in the wall to side of it. Shortly after entering the room, the Bell Ringer will ring her bell and a number of enemies will burst from the ground. The most immediate threat is a Huntsman that will appear behind you. Try to kill him quickly, because a Huntsman's Minion will also appear at the opposite end of the corridor and start closing in on you straight away. Once those enemies have been killed, go through the gate, which will cause the Bell Ringer to ring her bell once more, summoning a second group of enemies. A new Huntsman with a rifle will appear in the corridor, but he can't fire through the bars, so as long as you don't go back in there he's not a threat. Similarly, the Huntsman in the middle of the room should be ignored until you've dealt with the Bell Ringer and her new Wheelchair Huntsman guardian. The Bell Ringer should be your first target, because contending with her attacks while fighting the Wheelchair Huntsman can be difficult. It does mean that you'll need to be mindful of his shots; try to keep him in view at all times so that you know when he's finished reloading and can dodge accordingly Once the Bell Ringer has been killed it should be no problem to finish off the dazed Wheelchair Huntsman and severely weakened Huntsman. Four Hemwick Grave Women are gathered around the middle of this square, and if you're dropping down from the Connecting Staircase you should be able to kill the one closest to you before the others can react. Luring the remaining enemies around the railings and down the stairs can also help split them up and stop them from surrounding you, making the rest of the fight easier The stairs themselves will take you down to the Holding Cell, but approaching along this path will not allow you to get the Upper Cathedral Ward key from within the cell. From the top of the stairs leading away from the Widow's Requiem room, if you follow the railing along to the right, you'll find a gap that you can drop through in order to reach a ledge below. On that ledge you can find an item near the end, so grab that before going through the nearby door. There's a Huntsman's Minion with its back to you on the right as soon as you go through the door, and while it may be tempting to attack it, it's better to leave it alone and walk around to the left. In the middle of this area you'll find a Bell Ringer, and killing her will not only make fighting the two nearby Minions much easier, but also make the Rooftop Attack much easier to handle. Near the door you entered the upper part of the Holding Cell through, you'll find a gap in the low wall that you can drop through to land in the cell below, where the key to the Upper Cathedral Ward is sitting on a corpse. The remaining Minion here will start coming after you as soon as you leave the cell. Try to fight him near the exit to the room so that you're out of the line of sight of the Wheelchair Huntsman with the gatling gun. Once all of the enemies have been killed you can safely claim the Tiny Tonitrus from the chest. Before fighting the enemies in this area, drop down to the Holding Cell and kill the Bell Ringer there to significantly weaken them all. Once you go past the trees, the False God on the side of the building ahead will start firing down into the area using a continuous beam that traces across the ground. While the initial beam does not deal damage, after a short time the ground it struck will explode; watch for the glowing sections of the floor and stay clear of them to avoid taking damage. Try to do as much fighting as possible without going past those trees so that you don't have to contend with the False Gods attacks, and that will mean luring the enemies back towards you. Begin by going down the stairs, which will cause one of the Grave Women to come running towards you. After you deal with her, use a Pebble or ranged attack on the one facing away from you to lure it back towards you. A second group of Grave Women will have made their way up the stairs at the back of the area and among them is a Molotov-thrower; not only will you need to lure the other enemies away from the False God, but also from her. The other three move fairly quickly, so all you have to do is quickly run far enough to get their attention, and then retreat back to the stairs and fight them there. When all that remains is the final Molotov-thrower, try to time your approach between False God's attacks and kill her quickly before running down the stairs to the safety of the Yahar'gul Chapel Lamp. There's another Bell Ringer strengthening the enemies in this area, but it's worth taking out some of the other enemies along the way to her. Instead of going down the main stairs here, head up to the small garden area and drop through the gap in the railings. You'll land on a ledge with a Huntsman carrying a rifle, so take him out as quickly as possible. As long as you're fairly quick here, taking him out first ensures that he won't be able to shoot you in the back later. Just below the ledge you're on are two Rabid Dogs - if you have any strong ranged options, you can kill both of them from the safety of the ledge, otherwise drop down and use a plunging attack to weaken one before finishing them off. At the far end of the second half of the terrace you'll see a couple of Huntsmen and a Huntsman's Minion. Before going after them, drop down to the left of the stairs leading down and kill the Bell Ringer. As soon as she is dead, quickly run up and kill the two Huntsmen while they're stunned, so that you can deal with the Minion on its own. The final enemy to take care of is just past the end of the terrace, hiding behind a pillar. Be sure to take him out before going for the item there, to avoid being attacked from behind. This area might be familiar to you, but you no longer have the safety of the Hypogean Gaol Lamp, and the enemies here are quite different than before, so you'll need to be careful. Three Hunter enemies have taken up positions in the room: one with a Threaded Cane & Flamesprayer on the stairs, another with Beast Claws & Hunter's Pistol in the middle of the room, and finally, one armed with a Rifle Spear & Cannon. The Clawmark Caryll Rune (dropped by the Hunter with the Beast Claw) makes for a tempting prize, but acquiring it leads to a difficult battle with these Hunters. You can bypass the room altogether if you opened the one-way door leading outside during your first visit to this area, but then you won't get the Rune. Going down the central staircase in Yahar'gul Chapel will let you reach these areas, and even if you explored them during the first time you can come to this area, there are some items down here that make a second visit worthwhile. This time, when you go down the stairs to the Prison Cells, a Scourge Beast will be waiting for you, and if you go to the back of the Dining Room you'll find some Bloodstone Chunks on the body of a Kidnapper. Similarly, when you go towards the Storeroom you'll have to another new Scourge Beast. Down at the bottom of the Storeroom you'll find another Kidnapper corpse with more Bloodstone Chunks on it, so be sure you grab them before moving on. Huntsmen now occupy most of the Elevator Path, all strengthened by a Bell Ringer on the paved area overlooking Main Street. Before exploring the rest of this area, it's worth following the path to the right, running straight past the Huntsman and killing the Bell Ringer at the end, so that the other enemies are much easier to kill. If you've been picking up all of the Bloodstone Chunks along the way, it's also worth taking the elevator to get back to the Lamp at the start of the area for a quick stop at the Hunter's Dream to upgrade your weapons. While you're going up in the elevator you may also notice that the stained glass window that you pass is broken, and you can roll through it to reach a previously inaccessible area. Main Street has now been overrun by Cramped Caskets, and while these enemies may move slowly, once they start attacking they are extremely aggressive. If you can hit them with attacks that flinch then you can often keep them from attacking; if they've already started, it's best to wait until they slam down on the ground, as that allows you to move in and begin attacking while they recover. To make traveling down this section of Main Street easier, you may want to clear out the Elevator Path area first, because you'll be under constant fire from the Huntsmen with rifles there. A Cramped Casket now resides in the small alcove that used to be occupied by a Maneater Boar; as before, use the statue near the wall on the left to block its movement, and then quickly move around and attack it. Once it's defeated, be sure to head into the alcove and pick up the Bloodstone Chunks at the back. About halfway up the street you'll come across a suspiciously rocking wagon, in front of which are some more tempting Bloodstone Chunks. Do not try to pick these up, however, because when you get close, a Cramped Casket will launch itself out of the wagon at you; quickly roll out of the way to avoid its ambush attempt. Try not to move past the wagon while fighting that Cramped Casket, because a group of three more are gathered just beyond it. Walking just past the wagon will cause one of them to head towards you, which will allow you to draw it away from the others when you're ready to fight. You can lure one of the remaining two away with a Pebble, or walk up slowly behind one and use a charged R2 for an early advantage. Approach the end of the rooftop here carefully, because two Rabid Dogs will come running at you; try to use one of the walls nearby as cover and attack them as they appear, one at a time The room you can enter just past the rooftop contains a small bath, and if you inspect it you'll be transported to another bath, located near the Main Street Overpass. By traveling to that area via the bath you can kill all of the enemies on the bridge and overpass straight away without having to travel down the street. Down the stairs, just past the room with the bath, you'll come across a Wandering Nightmare. Be sure you have a weapon at the ready to kill it before it escapes. There's a Scourge Beast facing away from you near a wall at the bottom of the stairs, and if you approach it quietly you can easily land a charged R2 and Visceral Attack. Unlike the first time you came to this area, there are no enemies here. So if you didn't previously pick up all the items, you can do so now without fear. The large Gate at the end is also open now, giving you direct access to the rest of the Main Street. A new type of Cramped Casket is found in this area, and unlike the normal version, this one will exclusively attack you with bone spears from a distance. There are two of these enemies in total. Staying behind cover so they can't hit you is the key to getting through this area safely. Clearing out the Bell Ringer at the end of the Main Street Overpass along with the Huntsman with a rifle on the bridge will also help, but you can still make it through without doing that if you're careful. Start by approaching the back of the wagon, as that will give you cover from both of the long range Cramped Caskets. Wait there until you see a normal Cramped Casket coming down the stairs on the left. Walk around the left side of the wagon so that it sees you, and then lure it back towards you so that you can fight it from behind cover. With that first Cramped Casket down, advance to the side of the next wagon. From there, you should be able to lure another normal Cramped Casket back towards the side of the wagon, where you can fight it while behind cover. Now all that's left is to focus on the two long-range Cramped Caskets, so quickly run across the street towards the one, and try to fight it near the wall of the building, so that the statues block incoming fire from the other one. When only the final one is left, stand behind the statues and wait for it to fire, and then quickly close in kill it before it can fire again. As soon as you reach the top of the stairs leading up to the bridge, a Scourge Beast will start to walk across it from the other side, so if you want to kill the Huntsman in the middle first, you'll need to be quick. Alternatively, you can wait at the top of the stairs, using the wall to block the Huntsman's shots, and then fight the Scourge Beast once it crosses the bridge. There is a Huntsman with a rifle on the stairs leading down in this room, but the railings and pillars in the area provide plenty of cover as you approach. Once you reach the top of the stairs, simply wait for him to fire, and then close in and kill him before he can reload. If you walk slowly down the stairs, you can get behind the Scourge Beast there and kill it using a charged R2 and visceral attack combo. Going through the door here will let you get back out onto Main Street, and if you haven't already killed them, you can go out and safely get rid of the nearby ranged Cramped Caskets if you hug the wall. The small bath here is where you'll appear if you use the one at the Main Street Overlook. You can also use this one to be transported back there, so you con quickly access the elevator and return to the Lamp when you need to. Continuing through the door will take you out on to the overpass. As soon as the Bell Ringer at the other end spots you, she'll summon a Huntsman that you'll have to contend with before you can kill her The ladder near the Bell Ringer will take you down to the midsection of the tower, from where you can drop down to the roof of a wagon, and again to reach the floor. Provided you have killed the long range Cramped Caskets, you won't have to worry about any more enemies in this area, so you can explore freely. At the end of the raised areas to either side of the street you'll be able to find some Madman's Knowledge. Once you have them it's time to head through the large archway at the bottom and face off against the boss. The red-robed Bell Ringers that are on the upper level of the boss room will constantly throw homing fireballs at you if you try to attack the boss straight away. So the first thing you should do is use the stairs at the back to get up there and kill them all. Once The One Reborn has been defeated, you'll automatically receive three Yellow Backbone Holy Chalice ritual materials, and the new Advent Plaza Lamp will appear. If you go up the stairs just past the Lamp you'll come to a small room, at the back of which there's a mysterious mummy sitting in a chair. Inspecting the mummy will cause you to be transported to Lecture Building 2F. Since you should have the Upper Cathedral Ward key now, it's recommended that you use the Lamp to return to the Cathedral Ward Lamp. From there you can go through the Healing Church Workshop to reach the door at the top, and finally enter the Upper Cathedral Ward.